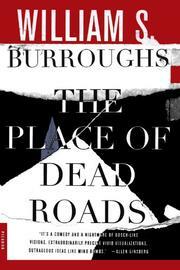 It becomes more and more difficult to believe that Burroughs can be seriously read by anyone much over 21, by anyone but a post-adolescent with a self-congratulatory streak of perversity. The Burroughs formula, after all, is by now dog-eared: a young, polymorphous, homosexual hero takes on the Manichean bad guys of the world, vanquishing them through various tricks of time-pleating, cunning, or drug-use--and, in this new installment, through a large-caliber dependence on (and fascination with) guns of all kinds. Here, then, backed by an honorable bunch of outlaws, young Kim Carson, pulp novelist and exquisite trigger-man, blasts away at his foes: the FDA (with their "legislation aimed at outlawing liquor, drugs, gambling, private sexual behavior or the possession of firearms"); the English; the Italian Mafia in America; and dogs--with repeated descriptions of assorted, grisly dog-executions. There are effective sequences now and again: Burroughs allows himself to write lyrically of his St. Louis boyhood in an impressionistic (if also familiar) clutch of passages; and there's an amusing, speculative science-fiction section on "language-shots'--by which a language can be inculcated through the body's cells by injection. The rest, however, is more of the usual nonsense--notched to Burroughs' own anarchic sensibility but ultimately no more convincing than the programmatic novels of an Ayn Rand, a Robert Rimmer. Routines and shticks--blackly comic--were what gave Burroughs his initial distinction; but now they have lost their spleen and have become mere eccentricity, puerility. In sum, then: only for the coterie.